As often happens, it's an email that's inspired today's post.... I got one from Zack, who's read my blog, and wondered why I hadn't written about sustainable growing. It's a big thing in his home garden, with varying degrees of success, so he was wondering how it fared on a much bigger farm. My first thought was "I bang on about sustainablity all the time!" but actually looking through the blog, I havn't recently. So coupled with the discussions that I held with my breakout group at the Flowers from the Farm conference on Monday, this post is all about how my Small flower farm, has become, and continues to be even more sustainable each year. avoidance of the depletion of natural resources in order to maintain an ecological balance. "the property of biological systems to remain diverse and productive indefinitely"
So my flower growing business needs to be sustainable on 2 levels. The biological systems that are needed to grow healthy plants, that provide fantastic flowers. Plus the ability of my business to continue on year after year, providing top quality flowers for the customers, making me a decent living, and providing a workplace for my staff. Actually for me the 2 are really closely intertwined. When I started the farm, I didn't have money to invest. My Mantra was reduce reuse recycle. Manure from local horse stables, pots from the local garden centre, plants from local gardens, vases from charity shops, cast out kitchens, 2nd hand greenhouses, packaging cardboard, wooden pallets, waterbutts, bins, milk bottles, newspaper have all been repurposed on the farm. All with the aim of creating better growing conditions. If you get known as someone who recycles, it's amazing what comes your way. What we do buy in is recyclable. Twool, (shown above) is our biodegradable flower tie material, We wrap our flowers in paper and tissue, and if water is needed for transport we use buckets or vases, not plastic wrap that will be discarded and binned when home. We offer a money off your next purchase recycling scheme to get our vases back. If we buy in flowers, we always go for those with as little wrapping as possible. 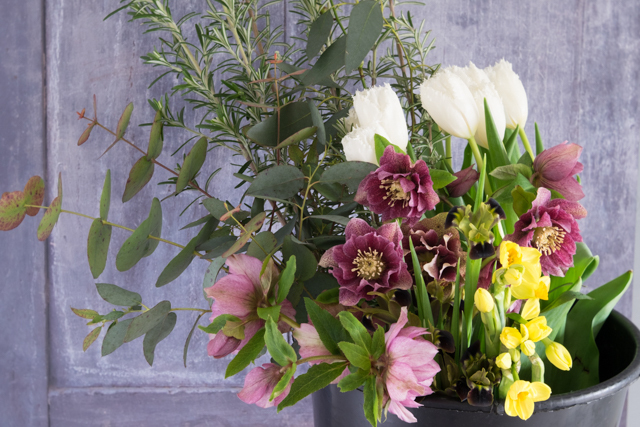 - We love Smith and Munson Tulips as they come in paper wraps that go on the compost heap. plus Narsissus that need no wrapping at all. If we need to wrap our flowers while they condition, we use newspaper. There is no electricity at the farm. Great for the environment, brilliant for my work / home life balance. No temptation to be at the farm late. Short days in the winter, longer ones in the summer. No debates about when visiting groups need to leave, Dusk it is... We use power tools a minimum amount, mindful of noise pollution as well as the fuel used. The Plastic we do use, is all bought with using it as many times as possible. We've bought stronger sowing trays, which should last 10 years or more, Environmesh for covering the plants to protect them from pests. But the best addition to our Sustainability on the farm has got to be the weed fabric. Unlike a lot of flower farmers, we rarely use our fabric to plant through. We use our fabric in the off season. When we started, we hand weeded all our beds at least once a season, sometimes twice. Back breaking, and not productive, and it meant there was no profitability from some crops. After our first season we ran out of time to weed, and the beds were left with fading crops, and they just grew over with weeds. We could have used chemicals, but i don't like using them on the plant beds, only occasionally on the paths and hardstanding, so we had the same amount of work to do in year 2 as year one. We learnt from that, and now we strim the crop as it finishes. We leave it on the bed, and cover with the weed membrane. Between 2 and 5 months later depending on the time of year, and how soon we want the bed, we lift off the membrane, rake off the debris (a lot of which has mulched down into the soil enriching it) hand weed any deep rooted perennial weeds (fewer and fewer each year) add additional compost if needed and plant again. This takes so much less time and input, and creates such good bed conditions, that it has to be our most sustainable process on the farm. It means we have more time to raise great quality plants in our recycled greenhouses, and my team enjoy working at the farm, instead of coming in to endless weeding every week. It means our time can be used picking and selling fabulous flowers that make people smile. That's the best part about a sustainable business : Happy smiling customers and staff.